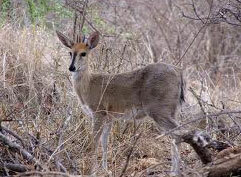 The common duiker are found all over South Africa. The common duiker has survived the onslaught of all its enemies by being the most wide awake little antelope of them all. Their colour may vary from light grey to a much lighter combination of yellow and red brown. It so much prefers leaves (and wild fruits) to grass, that it will not easily settle if a fruit is just out of reach, even if it have to stand on it's back-feet for a moment. If times are rough, it will also eat what is not flora (such small birds) to survive. What may happen in some instances (as in other antelope species where the female don't usually have horns), is that the female may develop smaller and weaker horns, although this isn't seen much. A small triangle of black hair between the horns have been mistaken at times as a third little horn. When the duiker takes flight, it will dodge and side-step, combined with bounces in the air with erected legs, very quick to put some cover between itself and the danger it is sensing.